Fast Network Wireless Ready Workgroup Multifunction Printer. Laser A4 Mono USB & Network Ready Desktop Mu ltifunction Laser Printer. Brother MFC-7460DN. Up to 26ppm Mono Print. 1 x Brother MFC-7460DN. The Brother MFC-7460DN is a fast and powerful black and white all-in-one printer that delivers print, scan, fax, and copy capabilities. This versatile printer is an ideal choice for a small office or home office. Weighing 25.6 lbs and measuring 15.9 inches wide by 12.4 inches high by 15.7 inches deep, this ENERGY STAR-qualified Brother laser printer can print and copy up to 27 ppm, with a maximum printing resolution of 2400x600 dpi and an optical scanning resolution of 600x2400 dpi. The maximum duty cycle for this all-in-one printer is up to 10,000 pages a month. 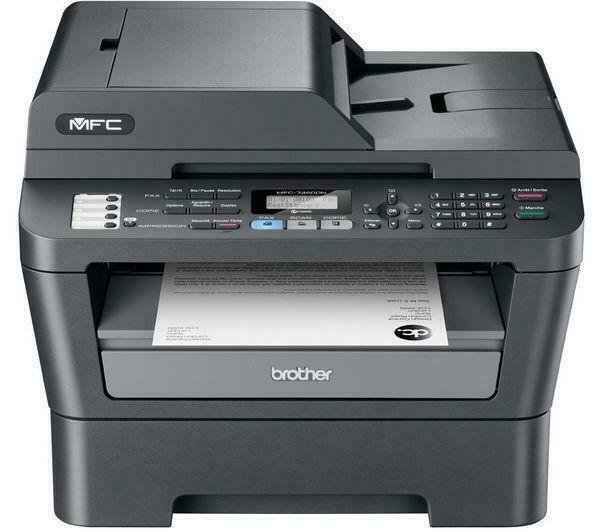 This Brother MFC-7460DN features the ability to create PDF, JPG, TIFF and other formats from scanned images. This Brother laser printer also offers a lower cost of ownership with available high-yield replacement toner cartridges. Connectivity for this Brother laser printer is available via Ethernet and USB, and this printer is compatible with Windows 2000, XP, and Vista, as well as with Windows 7 and Mac OS X 10.4.11 and newer.